Between Jan 30 and Feb 5, notable shareholding changes filed with Bursa Malaysia included those by Datuk Tiong Kwing Hee at Ecofirst Consolidated Bhd and Meda Inc Bhd, both of which have property-related businesses. According to a Jan 30 filing by Ecofirst (fundamental: 0.70; valuation: 0.30), Tiong acquired 20 million shares or about a 2.8% stake on Jan 13 at 16 sen apiece on the open market. He bought another 862,600 shares on Jan 29 at 31 sen apiece and 6.27 million shares at 30.6 sen on Feb 10, raising his direct stake to 14.36% while deemed interested in another 1.4%. On Feb 4, Tiong also acquired 10 million shares or a 2.07% stake in Meda (fundamental: 0.65; valuation: 0.60) and another six million shares on Feb 10, raising his stake to 14.72%. Ecofirst is in the midst of finalising the acquisition of two pieces of freehold land measuring 61.58 acres in Ulu Kelang for RM145 million from Zurich Insurance Malaysia Bhd. The parties agreed to extend the date for deal completion to July 31. Filings also show that Priceworth International Bhd (fundamental: 0.15; valuation: 1.2) managing director and largest shareholder Lim Nyuk Foh disposed of 10 million shares or a 3.52% stake in the timber concessionaire on Jan 28 and another 5.3 million shares on Jan 29 at undisclosed prices, cutting his holding to 7.97%. The stock traded at between 19.5 sen and 21 sen on the two days. Priceworth is diversifying into oil and gas support services. At condom maker Takaso Resources Bhd (fundamental: 1.25; valuation: 0.30), Yap Hoong Chai ceased to be a substantial shareholder after disposing of 10 million shares or a 5.03% stake on Jan 23 via a direct business transaction. OCR Land Holdings Sdn Bhd, a company owned by Takaso’s largest shareholder Ong Kah Hoe, recently appointed Takaso Land Sdn Bhd as the main contractor for the construction of a 21-storey commercial building in Jalan Kuching. The contract is worth RM37.4 million. Elsewhere, Tan Sri Tan Kean Soon bought 5.5 million Tanjung Offshore Bhd (fundamental: 1.95; valuation: 1.80) shares at 44.8 sen apiece on Jan 29, raising his holding to 24.16 million shares or 6.5%. He is also deemed interested in another 1.08% stake. Tan was suspended from an executive position in the company effective Jan 28 following investigations into a possible breach of fiduciary duties and conflict of interests by several senior officials. At Matrix Concepts Holdings Bhd (fundamental: 1.85; valuation: 0.90), managing director Datuk Lee Tian Hock disposed of 10 million shares or a 2.18% stake to an institutional investor at RM2.73 apiece on Feb 4. This cut Lee’s holding to 41.2%. Buma Bina Sdn Bhd ceased to be a substantial shareholder of Pasdec Holdings Bhd (fundamental: 0.65; valuation: 1.80) after disposing of 2.04 million shares or almost a 1% stake on Feb 2. Closing at 45 sen on Feb 11, the stock was up 21.6% from its low of 37 sen on Dec 17, but had about halved from its peak of 87.1 sen on June 17 last year when it courted an unusual market activity query. The Pahang-based property developer recently announced a joint venture to turn 154.12 acres of land in Bandar Putra Kuantan into residential and commercial properties. 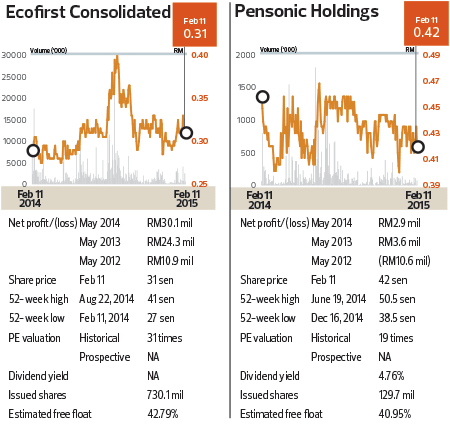 Closing at 42 sen on Feb 11, the shares of Pensonic Holdings Bhd (fundamental: 0.35; valuation: 3.00) have eased about 3.4% over two months. Filings show its founder and chairman Datuk Seri Chew Weng Khak disposed of 900,000 shares or a 0.69% stake at 48 sen apiece between Jan 29 and Feb 4, cutting his holding to 44.55%. Another director, Tan Sri Tan King Tai, however, bought 134,000 shares or a 0.1% stake at between 42 sen and 42.29 sen apiece from Feb 6 to 9, raising his holding to 7.96%. Pensonic reportedly expects a 10% drop in sales between March and May this year following the implementation of the Goods and Services Tax.